One of the best habits of a healthy eater is to keep portion sizes in check. Working out what a portion size can be quite difficult – most of us tend to overestimate what it should be. To get into the habit of eating the correct portion size we should really measure and weigh everything. However, realistically most of us probably won’t have the time or patience to do this. However, don’t give up – one of the best ways to calculate a proper portion size is to visualise it. 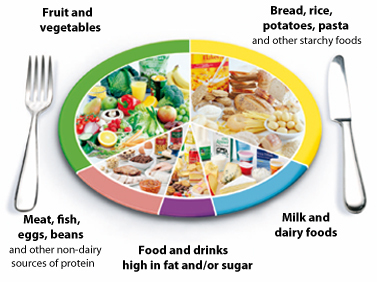 You could try the Eatwell Plate – this highlights the different types of foods we need to eat for a healthy diet and shows the proportions we need to achieve this. Other ways of visualising portions includes relating them to everyday things such as a CD representing 1oz (28gms) of grains, a deck of cards representing 3oz (85gms) of meat and a tennis ball representing a medium piece of fruit. Use these as a starting point and search around to find the right tool for you, to help build up your healthy portion size habit.